We’ve compiled some of the most common planning concerns in an effort to help guide you to the perfect shed. From gardening and equipment storage to poolside storage, to whatever you’ll be using your shed for, we’re sure you’ll find these tips and ideas helpful. And don’t forget we’re here to help with any specific questions you’re sure to have along the way. From a practical standpoint, it’s wise to locate storage sheds close to where they’ll be needed most. Kids in particular are much more likely to put bicycles and toys away if the access to the shed is convenient. On the other hand, if you are looking at garden sheds, you may want to locate it next to your garden, in a spot that receives lots of natural light. Aesthetics are always important; you may choose to highlight your structure by making it the center of attention, or blend it into your landscape and make it a secret hideaway. You should also be mindful of the sheds relation to other structures that you may have on your property. Achieving a balance is important. Other things to think of when choosing your sheds location may be it’s proximity to water (do I need a hose, do I want to plumb it), natural light, ventilation (although vents are available), and electricity (artificial lighting and electrical for gardening and other tools may be desired). Consider the way the shed will look year round. Surrounding foliage (and weather) can be very different from one season to the next. All of these considerations may have some impact on where you decide to place your shed. Once you have decided on a size for your shed (see ‘shed sizes’ below), it’s a good idea to physically stake it out on your property to ensure that the fit is comfortable for you and is harmonious with your surroundings. Grade – Ideally your site should be level, with a slight pitch towards the rear. This will allow drainage of water without having to excavate around your shed. A shed may be located where the ground slopes more steeply (i.e. greater than 12″ from one side to the other) however, if this is the case, more thought should be put into the foundation you are going to build. Try to avoid positioning a shed at the bottom of a hill but, if you must, ensure that you beef up the drainage with a 6″ gravel bed around your shed or some other appropriate foundation. If you are planning to store wheel barrels and lawn mowers, and there is a slope, be sure to consider adding a ramp to your shed. Our range of shed styles, sizes, and options will allow you to design and build your shed for functionality without having to compromise on style. Be sure to spend sufficient time browsing our shed photo galleries and you will benefit from all the designs that others have come up with before you. Choose a shed style that reflects your personal taste and fits in to the landscape. Don’t worry about your shed matching your house; not every thing needs to match…and why not be a little eclectic! 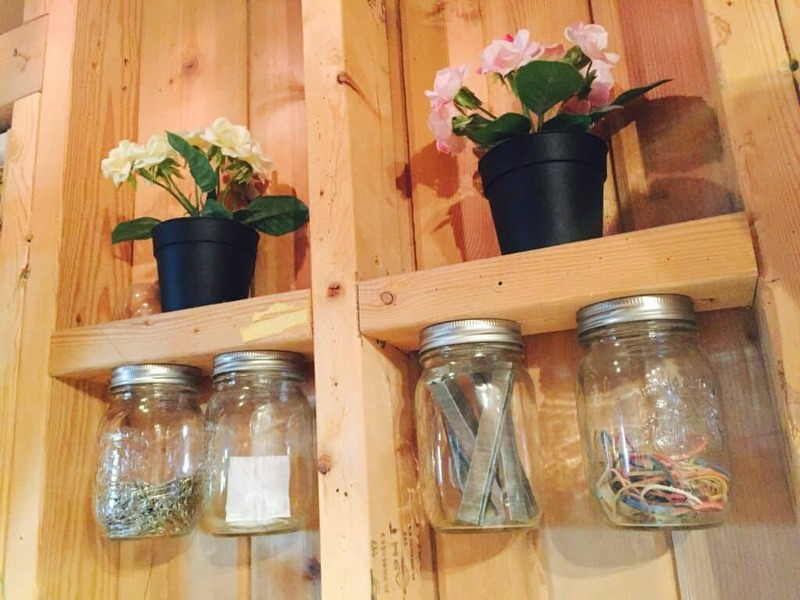 You can customize your shed to your heart’s content, implementing your personal flair along the way. Most of our shed styles are differentiated primarily by roof lines (i.e. gable, hip, lean to, salt box), so this is an important consideration. It’s important from the beginning of your decision making process to think about the interior design of your shed. If you are storing large items like a lawn mower, you don’t want to constantly be moving it in order to get to smaller items like shovels and rakes. Double doors on your shed make for easy storage of and access to large and small items alike. shed and help separate bikes from strollers, from gardening supplies. If you’re going to be using your shed for storage, consider the placement of doors and windows. Keep in mind that storage space is lost where windows are placed. Placement of doors is also important to ensure convenient access to all the stuff inside. Obviously hooks, shelving, benches, bins and other creative ideas are useful in helping to keep things organized. Whatever your requirements are, we have oodles of shed options to choose from, so you shouldn’t have much trouble achieving a good fit to your tastes and needs. It’s smart to think about how you may want to cultivate the landscape in your shed’s immediate surroundings. Shrubs, flowers, and vines on trellises can be a nice complement to a shed and will help to define the space. Many people will also choose to lay flagstone or other pavers to create a pathway to their shed. A little garden decor will also help to create a tranquil space. Strategically placed accents like trellises, pergolas, cupolas, lights, wind chimes, wheelbarrows, birdhouses – and even your favorite piece of weathered furniture can go a long way in creating that outdoor sanctuary you desire. There is often much deliberation over what the perfect size is for a shed. There is no wrong choice, and to make it easier, we offer a wide range of sizes (custom as well), so rest assured we’ll have the right size for you. Clearly, the key is to ensure that your shed is large enough for its intended purposes. Think of what you’ll be using the shed for and what is going to go inside. An easy way to do this is to physically map it out in your yard. Get some stakes and string and physically stake out the size – 10 x 12, 12 x 14, etc… Then, if you’re feeling energetic, gather all of the items that you might be storing in your shed (bearing in mind that many items may be stored on shelves), and see how they fit within this staked out area. If you’re going to be using the shed as a potting shed, storage shed, pool shed, etc.. be sure to measure bench depth, shelving heights and pool equipment such as pumps & filters, to ensure you’ll have enough room. A partition wall may be worth considering if you want to separate contents or activities. If you intend to combine your storage needs with work space, make sure to allow for enough space for both you and your stored items. A dual purpose shed doesn’t have to be massive, providing you assign different uses to different spaces and incorporate some thoughtful and inventive design into your plan. Decisions made on the size, location, and style of your shed are not entirely in your hands. Check with your local municipality to ensure that you are meeting all zoning and permit requirements. Generally, if your structure is under 100 sq. ft. you will not require a permit however, there can be restrictions such as a two or three foot set back from a property line. See permits and zoning for more information, and be sure to check with your zoning office, better safe than sorry! Please feel free to contact us at any point in the planning process and we will provide you with as much help as you need. All our shed building materials are hand selected and thoroughly inspected before we use them to build your shed. The following details provide some basic information on the materials and construction methods you can expect with your Summerwood shed kit. Sheathing: We use square edge 4 x 8 sheets of 3/4″ T & G. You may want to upgrade to fir plywood, or consider a T & G pine for a different look. Shed Joists: We use 2 x 4 spruce (with perpendicular 2 x 6 (or greater) P.T. runners underneath). Although not necessary, some people prefer to go with P.T. for the floor joists as well. Shed Shingles: We offer cedar shingles that can be purchased for your structure at the time of sale, but there are other choices that may be purchased from your local hardware store (asphalt shingles, for example). Whatever you choose, be sure to follow the installation instructions closely. Please refer to the roofing section on our website for more information. Garden Shed Siding: We generally use four types of siding in the production of our products: cedar channel siding, cedar log siding, cedar shingle siding and Canexel wood fiber siding. Canexel wood fiber siding: 1″ x 12″ and it covers approximately 11 feet per row. It has a 15-year manufacturers warranty and comes in a compelling range of colors with virtually no required maintenance. Cedar siding: 8″ wide western red cedar channel siding with either the rough or smooth side out. It covers 6 3/8″ per row and is a lovely material that looks beautiful on every shed style. Cedar shingles: 18″ in length and 7/16″ thick, they give a truly distinct look to the building that they’re put on. Studs: We use at least 2 x 4 spruce studs every 16″ OC. If you love cedar, consider upgrading to our cedar package. You’ll need to decide whether you’re going to take on the project of building your shed yourself or if you’re going to hire someone to do it for you. Most of our customers tackle the project themselves and quite enjoy it; a form of therapy or family bonding if you will. Many will get their friends and neighbors involved, basically anyone who’s going to be spending time your backyard is fair game. If you are an accomplished ‘do-it yourselfer’, or are ready to make your debut, make sure that you have both the time and the energy required for the task at hand. For detailed information on assembly and the tools required for the assembly of your shed, please read our shed assembly. If you’d rather have a professional build your shed for you, be sure to have a look at our how to hire a contractor package. It will provide you with all the information you’ll need to know to get someone else involved. We have a database full of trustworthy and reliable contractors located all over Canada and the US, so we’ll be able to connect you with one, almost anywhere. We can also help you find reliable contractors for related issues such as landscaping, gardening, architecture, pools, spas and more. Have a look at our resources page for more information and links to partner websites. We know style is a personal issue. That’s why at Summerwood we offer choices. Remember all our sheds can be customized to your personal requirements. They range in size from as small as you want to as big as you want. From basic storage and garden sheds, to elaborate dual purpose sheds – we’ve got you covered. Palmerston Sheds – The Palmerston gable roof design is our most basic and most popular style. The look is clean and the space functional; roof trusses double as storage space for sports equipment and other items that need to be tucked away. A dormer adds a nice touch to this style. Sarawak Storage Sheds – If space is tight, our Sarawak lean-to shed is designed to offer you the optimal storage solution. It works well partitioned into a multi functional space or with a large set of double doors for easy access. Bar Harbor Sheds – An ideal shed for the avid gardener as a potting or storage shed for your garden tools. The saltbox style roof features exposed cedar rafters and 1 x 6 cedar roof boards. Pioneer Barn Sheds – Our Pioneer barn shed combines new world construction with old world design and craftsmanship. The shed features a roomy loft with 1 x 8 pine flooring, a barn door hatch, and a wood ladder. Catalina Corner Sheds – The five sided roof design of this shed certainly adds an interesting dimension to your landscape. A great choice nestled into a corner facing your yard. Sonoma Sheds – The Hip Roof design of this shed offers a little more flair and versatility. The use of rafters instead of trusses also creates more of an open feeling. This style is easily dressed up with numerous door and window options. Melbourne Sheds – This unique shed design offers an understated elegance that is not usually associated with garden sheds. The Melbourne is a big hit with our landscape architect clientele. Telluride Sheds – Our Telluride is defined by its steep roof pitch and rugged natural good looks. This spacious design is ideal for both storing and working with tools. It comes all dressed up with large double doors, antique hardware, vertical cedar siding, country quaint windows, and may be dressed up with some very stylish cedar wall lattice. Copper Creek Sheds – This shed features a steep roof pitch, providing just the right amount of drama. Bring in a steep peak over the door and you have an irresistible structure that’s just waiting to be personalized. This style is an idea potting shed, providing the space that’s required and the storage in the trusses that we can’t live without. Glen Echo Sheds – A great utility shed, this building offers a bright and spacious addition to any setting. An extra foot of wall height and windows make it versatile and the extension of the gable roof is very unique. The 2 or 3ft. overhang (your choice) provides more loft storage space and it doubles as a porch. A great place to sit and relax. Chimalis/Haida Small Sheds – Don’t let their size fool you; these shed designs are extremely practical for those with a tight space. The 10:12 roof pitch maximizes storage space to accommodate ladders, skis, and more. Gable front, gable side: a great style – customize it any way you like. Santa Cruz Sheds – California inspired, this shed provides a lot of headroom with the beautiful Dutch Hip Roof and plenty of light with the spanning doors and windows. It’s perfect for use as a shed and it doubles as an entertainment facility. There’s no need to run back and forth from the house. Battling with clutter? It’s an on-going struggle for many of us. In most cases, you’ve exhausted your options. You’ve sorted and reorganized. You’ve purchased and experimented with shelving units and storage tricks (check out some of our own: “8 Essential Garage Storage Tips You Must Try” and “Don’t Let Your Shed Become A Black Hole This Summer”). You’ve had one garage sale too many, and now you’re keeping what’s left of your belongings but need a way to store it all. One of our recent customers came to us with exactly this problem. Ben said, “My garage was getting cluttered. I wanted to get my lawn tools out of the garage to make room for walking in there!” Frustrated with his situation, he decided to build a shed. When the need arises to increase backyard storage, for most of us installing a shed is the first option that comes to mind. The same was true for Ben and Mary, who realized they needed to build a shed primarily for this reason, but also thought it would be nice to house a secondary workshop. We tagged along with the couple as they lived their shed install process from start to finish. Our Palmerston model is a cute and classic choice. The Palmerston shed they designed for their project was delivered to them in a pre-assembled kit. As the name suggests, this means the builders at Summerwood have done much of the work in advance as small sections of the building have already been put together. Once delivered on site, the remaining larger components are assembled by the customer, which was perfect for Ben. These kits are popular for those who are looking to do some, but not all of the DIY. As much of the work such as sourcing material, planning construction, measuring and cutting is already complete, once the package arrives it’s as simple as following the included instructions to put the big pieces together. Don’t worry, if you hit a glitch along the way, our installers are just a phone call away. Pre-cut kits are the best of both worlds: save some money and put in the elbow grease, but you’re not starting from scratch. They had a flat area available to put up their shed, which didn’t require much leveling. Following advice from our design experts, they purchased 2″ thick concrete patio stones from their local home improvement center, stacking them by degrees. “I stacked them till I got a fairly level area.” It’s not always necessary to create an elaborate concrete pad. If your building is small, and placed in a generally flat spot, patio stones are all you need. For more information about foundations, head here. The stacked patio stones level the floor. The next stage of construction was flooring. At this point, Ben was glad for the pre-assembled kit. “That (the flooring) was not too hard. Summerwood’s box frame simplifies the assembling of the floor.” Following that, their main task was fitting the tongue and groove plywood sheets together and nail them to the top of the frame. Easy enough. What part was the hardest? According to Ben and his son, the roof made them the most nervous. Ben wasn’t confident about the construction of the roof and was glad he spent extra time to get it right. His pre-assembled kit came with 5 trusses, already constructed. With time and care the process went smoothly but in hindsight, Ben advises others to rent or borrow several decent ladders for this stage of construction. (3) Laying out all the shed sections. (4) Flipping the floor section. (5) Placing floor on patio stones. (6) The floor is firmly in place. (7) The walls go up fairly quickly. (8) Sheathing the roof with plywood. (9) Final touches to the roof. (10) The window is installed. (11) Small shrubs cover the raised foundation. (12) Tada! The Palmerston looks great! As for siding, Ben and Mary had ordered the optional Canexel siding for their Palmerston shed instead of opting for cedar. As our maintenance free option, it requires no effort beyond the initial installation. Available in over 20 shades, it comes colored in a shade almost identical to their home, which stylistically was important to Mary. “It virtually matches the siding of my house.” To complete the effect, Ben painted the doors on the shed to match those on their house. “We think it’ll increase the value of the home because they look like they were built together.” To read more about the best siding options, check out “The Best Materials for Building Your Own Shed”. Sure, we all want an immediate solution to our storage problems, but taking the extra time to select an option that’s designed with you in mind will only make it more useful in the long run. When you’re tired of playing the reorganizing game, check our website to learn more about our custom backyard structures. A high-quality shed will last for decades, and the right choice will increase the beauty of your yard, instead of looking like an eyesore! Sure, everyone’s first reason for constructing one is storage, but never far behind is that old favorite, property value! If your afternoon of yard-work or gardening turns into hours of long searching through your shed for that elusive tool, you already well know the importance of organizing your outdoor storage space. Without a change in your organizational tactics, the total value of your lost items tally could potentially add up to about $5,500 over the course of your life. Furthermore, even without the need for lengthy searches for your belongings, the mere presence of household clutter can take a toll on your mental health over the years. Read on to better understand the impact of clutter on your life and get inspired to install and utilize organizational tools for your shed. When you lose items in your packed garden shed, you may end up abandoning the task at hand or heading out to the store for a replacement. The fruitless search coupled with the thought of having to choose between those two undesirable options may steadily increase your frustration levels. Even spending time in or around the cluttered space can decrease your ability to focus and completely expend your mental resources. Although you do not have to live within the chaotic space that is your garden shed, exposure to the clutter within even has the power to rapidly sap your productivity. As a result, you may abandon your planned outdoor activities, not just for the day, but also well into the future. You can reclaim your shed, and your ability to complete your favorite outdoor activities, by transforming that storage space with a few key organizational elements. One such element is vertical space utilization. You will want to focus on taking advantage of as much vertical space as you can muster to keep the floor clear for large items. You can take advantage of vertical space by installing cabinets, shelves, racks and hooks along the walls. Magnetic bars also work incredibly well for keeping metal tools neatly organized along the wall. If you need more wall space for these organizational elements, add partitions inside your shed to break up the space into two or more sections. Remember to make use of the inside of the door with a few smartly placed hooks for your frequently used items, such as the garden hose. Gable roof adorned sheds, such as the Haida and Glen Echo models from Summerwood, have additional room for storage in the rafters. You can keep the space accessible and attractive, yet completely functional, with flip-down shelves and sliding bins. If you prefer an enclosed storage area, consider having a spruce or pine loft installed above the main shed space. You can easily access the loft space using a sturdy pull down ladder, which does not take up any extra room in the shed when shut tightly. Unfortunately, simply adding organizational elements to your shed space is not usually enough to keep your tools readily available. Whether you choose hooks, shelves, racks, cabinets, lofts or a combination of these elements, you must also adopt arrangement techniques that keep your belongings in their rightful places. You can assign each tool in your shed to a particular spot and mark that location with its name. You may want to use a small label, or even outline the tool in black marker to identify its home location. Separate the small items into individual categories and place them together in labeled bins. Place the bins on the shelves or loft space to keep the items within reach when you need them. Make sure the tools or supplies you normally use together are arranged in the same area of the shed, so you can speed through the process of gathering your tools for the job. If, despite utilizing these organization tips, you consistently find your shed in disarray, or sense it is becoming overrun with your outdoor tools and supplies, you may benefit from upgrading your shed or adding an another outbuilding to your lot. You can acquire purpose built sheds from Summerwood by calling 1-866-519-4634 or visiting the website. On the site, you can utilize the Design Center tool to create a fully customized shed that will work perfectly for your needs. While ordering, you can personalize your shed with organizational tools that will keep your tools and supplies neatly arranged at all times. After painstakingly selecting the perfect location in your yard for your garden shed, you undoubtedly expected the structure to instantly blend into its surroundings. Unfortunately, a little more work is required to make that expectation a reality. Since the garden shed has an aesthetically pleasing presence, the problem likely lies in the absence of plants framing the structure. A garden shed, especially when equipped with a trellis extension or nearby free-standing trellis, often only becomes a true part of your yard once it has been adorned with attractive flowers and greenery. To achieve the best results, you must carefully select the best plant varieties that will accentuate the design and materials used for your shed and trellis structures. Here are four options that will work in a variety of climate zones. With nearly 200 honeysuckle species available today, it is easy to find several that will thrive in your local climate. Each variety of honeysuckle features a strong, sweet aroma and gorgeous, wispy flowers in wide range of colors. The vibrant red flowers of the Dropmore Scarlet, in particular, pairs beautifully with the light yellow tones of the cedar used to construct your garden shed and trellis. When planted in rich soil, honeysuckle vines will quickly grow to the height of your outbuildings and span across the top. You must steadily thin the bottom of the plants to ensure they keep produce attractive leaves and flowers year after year. The beautiful Clematis flower species is a group of climbing vines featuring vibrantly colored flowers offset by rich dark green leaves. Although this flowering vine can be grown in full sun, it prefers partial sunlight, making it a perfect plant to grow over your shed or trellis. You can even encourage this vine to wrap securely around the 4”x4” corner posts of your trellis and hang over the edge of the post wraps. You must watch this vine’s progress as it grows to ensure it does not wrap around itself, which can inhibit proper growth. You can improve the look of your trellis, improve your health and save money to boot by growing grapevines along your shed and trellis space. When you grow your own produce, you are more likely to eat fresh foods and maintain adequate nutrient levels for excellent health. Since vines that produce table grapes are resistant to cold, most varieties do well in a wide range of climate zones. You will net the best results by outfitting the exterior of your shed or top of your trellis with sheets of lattice. The lattice supports the heavy grape bunches and simplifies the task of pruning the vines from the prior year. When it comes to the tri-color kiwi, the white, pink and green leaves of the male plant is the star of the show. In addition to the showy male plants, you will also want to pick up a few females, which have delicate, light green leaves. The combination will produce edible kiwi fruits within a few years of establishing the vine in your vertical garden space. You will need to initially prune the vines, so they grow around the corner posts and weave between the slats. Stick with the cedar corner posts for your trellis, if you want to grow this species, as the wood provides a better growing surface than fiberglass does. Spread the vines out across the trellis to keep the fruit from putting too much weight on a particular section of your structure. If you want to expand your vertical garden space even further, you can pick up additional trellis structures and outbuildings from Summerwood. The Design Center on the website allows you to customize the available structures to meet your needs. You can change the dimensions, materials and accessories to create a personalized outbuilding to suit your yard. If you need additional information about the available products that will work best for your project, go ahead and give the team a call at 1-866-519-4634. 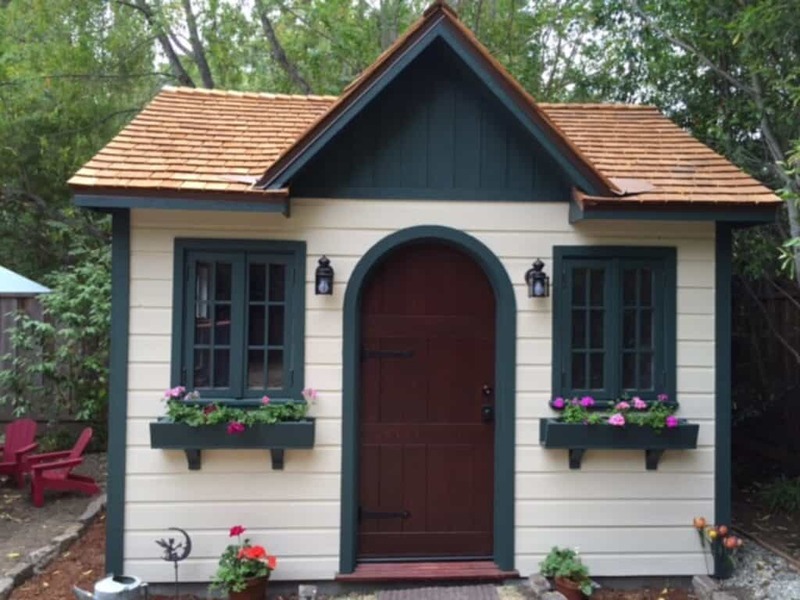 As the “mancave” recently exploded in popularity, women everywhere started dreaming of outfitting their own space – and the she shed was born. By transforming a shed into your dedicated area for quiet relaxation, reflection and focus, you can maintain your sense of self and independence while remaining close to the family. For this project, an old garden shed tucked into the corner of the yard just will not do. Instead, to make your perfect she shed, you can acquire a stylishly designed, pre-fab structure, place it in the perfect location and equip it as you see fit. Here’s how to proceed with this fun project. There are many factors to consider when selecting the best location for your she shed. Think about the sun’s path across your yard, especially in relation to the shed windows, when finding an ideal place for your structure. Tall trees and structures in proximity of the shed may alter the way sunlight streams in the window and alters the building temperature. With careful planning, you can even place the building in such a way that allows you to catch the sunrise or sunset as you enjoy your new space. Remember to also factor in your preferences when it comes to the proximity of your home, surrounding noise levels and overall landscape layout when deciding where to place your shed. Despite their relatively small stature, sheds may mimic the appearance and layout of barns, cabins, lean-tos and houses. Your planned activities in your she shed will influence the best style to select as the platform for your custom build. If you plan to use your she shed as your main art studio, for example, you may want to select a design with plenty of windows and shutters that allow you to directly control your lighting as you work on your latest project. If you prefer to switch hobbies with the seasons, sheds featuring tall roofs for extra storage can help you keep all of your supplies organized. Upon choosing your perfect shed design, it is wise to check with your local permit office to see if you need to secure a permit to build the intended structure. For most buildings of less than 110 square feet, a permit is not normally needed. Upon selecting your ideal shed structure, you can begin the customization process by selecting decorative elements. The elements should support your intended uses to ensure your shed meets your aesthetic and functional expectations. Exposed trusses, for example, can act as a decorative and functional element inside your shed. The trusses are the frame of the roof, which normally remain hidden behind a layer of sheetrock. Leaving the trusses bare raises the roofline and gives the space rustic charm. You may expand the size of the exposed trusses by altering the overall height of your shed before ordering. Dormer windows and French doors allow you to bring natural light into your she shed all throughout the day. On many models, you can choose where to place the windows and doors to create a shed that suits your preferences. The final step is selecting the finishing touches that will transform your shed into your ideal structure. The features you add to your shed dramatically alter its finished appearance. To select the best finishing touches for your shed, reflect on the way you would like it to look when you walk out to enjoy your space. Think of the flowers, signs and other decorations you will use to dress up the area around your shed. Select items that will complement or contrast those elements to create a stylish and cohesive outdoor area. To get started on your project, browse through the eleven shed options available from Summerwood. You can easily take any one of the available structures and transform them into the she shed of your dreams. 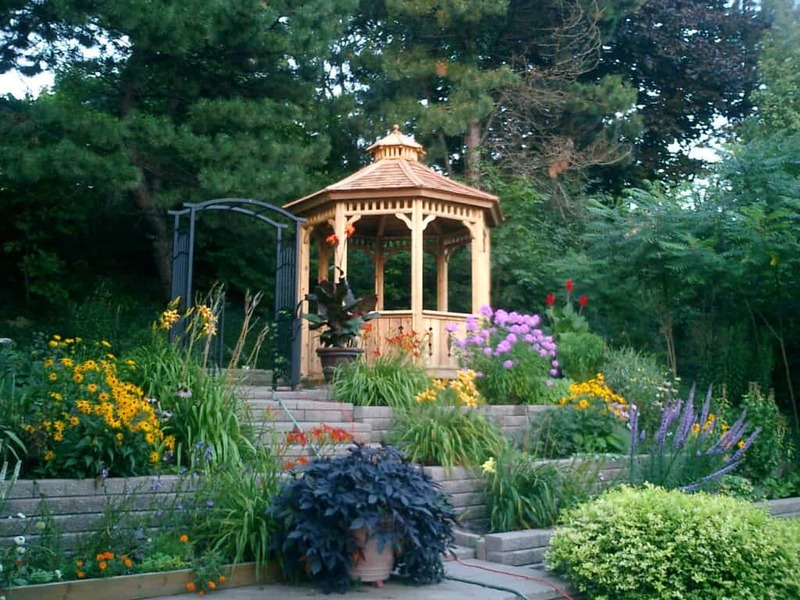 Summerwood expertly designs and fabricates outdoor structures for every location and purpose. Extensive customization options allow you to make your selected structure completely unique in style and function. Choosing the perfect location for your garden shed is one of the most important decisions to make for a new storage shed owner, and there are a few different key factors to consider. We get asked about this a lot and thought we’d share a few simple tips for picking the ideal spot in your yard for your new outdoor storage building! What is the primary purpose of the building? Based on what I’m using the building for, where will it be most convenient for me to access? Do I need access to a hose or water? Do I need a ramp? It can be easy to forget that lighting a garden shed is critical! There’s nothing worse than working on your yard late into the day and having to put away all of your tools and toys in the dark. Take note of what type of sunlight will shine on your shed’s new location and how this may impact its use. If going into a darker or shaded location you may want to add an extra window or two or perhaps add in some simple electrical to extend available hours of use. The soil and ground conditions are an often overlooked but essential factor in picking where to put a gorgeous customized storage structure. Locations that have pooling water or low spots in your yard are generally places to avoid. Ideally your site should be level with a slight pitch to the rear to encourage water drainage. In the event you have to build in a tricky location or low-slope area, be sure to prepare your site with ample drainage or a more permanent foundation involving concrete. A final consideration is landscaping, and ensuring that future yard plans are considered before deciding on a home for your garden shed. Remember that, while possible, it can be a challenge to move your garden shed after it has been installed, so it is important to carefully consider location prior to installation. Do you plan on installing a pool in a few years? 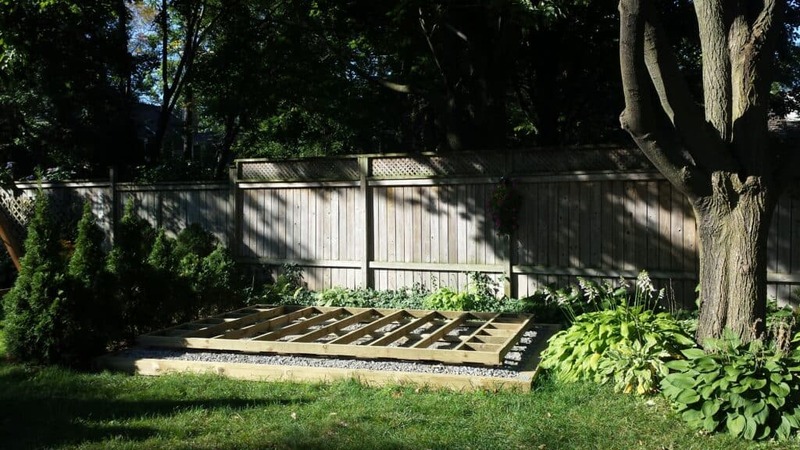 Are you going to tear down your deck and switch to an interlock patio? Is this building going to be a focal point of your yard or would you prefer it be tucked away at the side of your home? These are all significant considerations when picking the perfect spot. Depending on your circumstances it might make sense to hire a landscape architect to prepare a master plan for your yard prior to construction. These four simple tips are some of our most common suggestions when asked about choosing the perfect location to install a garden shed. Ready to pick the outdoor storage shed that’s perfect for you? Head on over to Summerwood where we have some great garden sheds for sale, and take advantage of exciting Spring savings, but hurry – our 20 or 40 sale ends on April 26, 2016!